Jessica Anderson is a connected science educator from Montana. 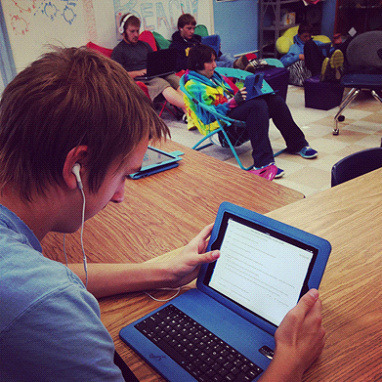 She has been teaching for eight years, both online and in the face-to-face classroom. As a BetterLesson Blended Master Teacher, she’s made her blended and gamified practice available to educator’s across the country via the BetterLesson website. However, as you step through the door, you enter Isle of Nosredna. What’s Isle of Nosredna, you might be thinking? It’s a theme that encompasses our earth science curriculum and our classroom goals of mastery and self-directed learning. It’s a game that was created to help keep students motivated while moving self-paced through the earth science content. I created it after gamifying for two years without a storyline. After research and interactions with several gamifiers, I was inspired to add a storyline to drive my classroom game. There are five zones in my classroom: the shelter (futons), the beach (carpeted area), the lookout (stools by window), the jungle (table area), and the crash site (my desk). Students sitting in Isle of Nosredna. We are 1:1 with iPads. I’m glad to say that your efforts at Paracini Ponds paid off. You now have enough food to sustain the PCSs [Plane Crash Survivors] for an entire month. You’ve found a safe place to store the food and have started planting seeds in some of the soil areas you collected from. It will be awhile before you can use the grown food, but it will be worth it once you’re able to. While you were gone a group of PCSs became ill. They’re not exactly sure what caused their illness; however, they suspect it was the drinking water (Insert suspenseful music: dah, dah, dahhhhh). Since you’re the only scientist on this island it will be your job to create a water filter and filter the water. You’ve got your work cut out for you before the rest of the PCSs become ill. Instructions: Find a source of water and use a homemade filter to purify it for drinking. Navigate to the Quest Contract to see what you’ll be required to master in this level. Scenarios like the one above drive the battles (activities) within each level. In each level, students are required to master a certain number of battles, depending on their chosen quest contract (grade contract), before moving onto the next level. If they are unable to master a battle, they find a different way to demonstrate their understanding. In our classroom, taking risks and making mistakes is acceptable as long as students work hard to master the content. This is a screenshot of how our course is set up in our learning management system. 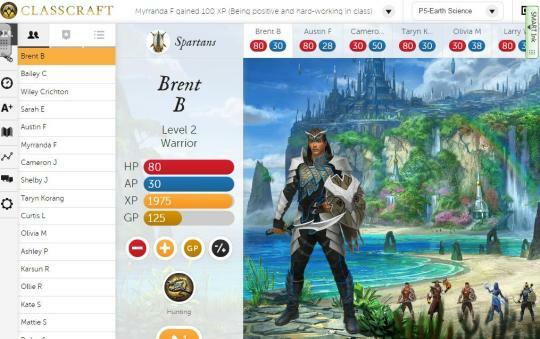 The behavioral side of the game is embedded in Classcraft. In the game, students are represented by avatars, earn Experience Points (XP), and sometimes fall in battle if they’ve lost too many Health Points (HP). If they are lucky, someone on their team will have the power to save them from falling in battle. Classcraft is the backbone of behavior management in our classroom and the driver of our self-paced class. Its most beneficial attributes are its ability to help students self-manage their behavior as well as keep my students’ progressing through their levels. I also love that students must work collaboratively with their peers to earn Experience Points, which is one of the main ways we build positive classroom culture. Within Classcraft, I have added events to connect our academic game to our behavioral game. For instance, I’ve added an event that all of the Mages can drink on the beach today. 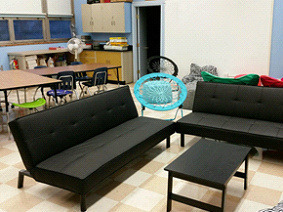 The beach is the section of our classroom with the bean bag chairs where students love to sit. Both the academic and behavior games work to engage and motivate students to work collaboratively and be self-directors of their learning. My students are motivated to move self-paced. They love that our classroom is different than other classes in the school. They like that there are no deadlines and that they can learn at their own pace. Many have said that the scenario in each level brings more meaning to the content and encourages them to move quickly to get to the next scenario. They also love that they are recognized with Experience Points for doing what they are supposed to be doing during class. They’ve become more collaborative as a result of the team dynamics of the game. They actually get angry with their peers when Health Points are lost and their team falls in battle. Students do everything in their power (if they have the power) to protect their teammates. They’ve figured out that if they help each other they are rewarded with more Experience Points. It’s a great strategy! They are starting to think it is OK to take learning risks and make mistakes the first time through a battle. This makes me particularly happy as it is a goal I’ve set for our classroom. I’m happy to see that with the elimination of number grades, an increase in verbal feedback, and the addition of Classcraft that we are finally reaching this mindset. Students are starting to see the true meaning of school: learning. All three observations are goals I set for my students at the beginning of the year. Five months in, I’m now starting to see the shift of classroom culture that I’ve been working so hard to achieve. It’s a great feeling! It truly is amazing what a fancy name, storyline, and some team dynamics will do for a classroom environment. I’m looking forward to seeing what else is in store as a result of Classcraft and my academic game as the year continues!